Island: Theme and Migrations is a work for two pianists at two pianos. 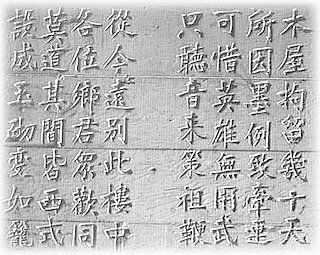 Island: Theme and Migrations refers to Angel Island, the Ellis Island of the West Coast, where Chinese sojourners carved their poetry into the walls of the immigration barracks. I think about their hardships and desires as I etch out sounds with gestures that come from the main theme. These migrations, variations in the classical music sense, vary from performance to performance because I've cut open the notation. Melodies and chords float around the score. Two pianists are separated by the bodies of two grand pianos as if they were separated by the ocean. The strings resonate between them as they touch the keys like sunlight bouncing on the waves. Across the distance, the pianists hear each other.